Even the most magnificent world’s museums such as the Louvre or the Smithsonian Institution National Museum of Natural History are organized with the idea of inviting visitors to admire their collection of art and artifacts by walking around and looking at them. There are, of course, museums that have a much more experiential approach to imparting knowledge and sharing their collections. A couple of them are on the two opposite sides of California. In Southern California, there is The Getty Villa- a museum conceived and built by J.P Getty, an oil magnate who was famous for his business acumen, an incredible dedication to his beloved antiquities, a mean-spirited attitude towards his family and a legacy that ensured that Los Angeles has great highways and non-existent public transportation. Getty’s famously unloving behavior towards his kidnapped grandson was recently portrayed in Ridley Scott’s movie All the Money in the World. 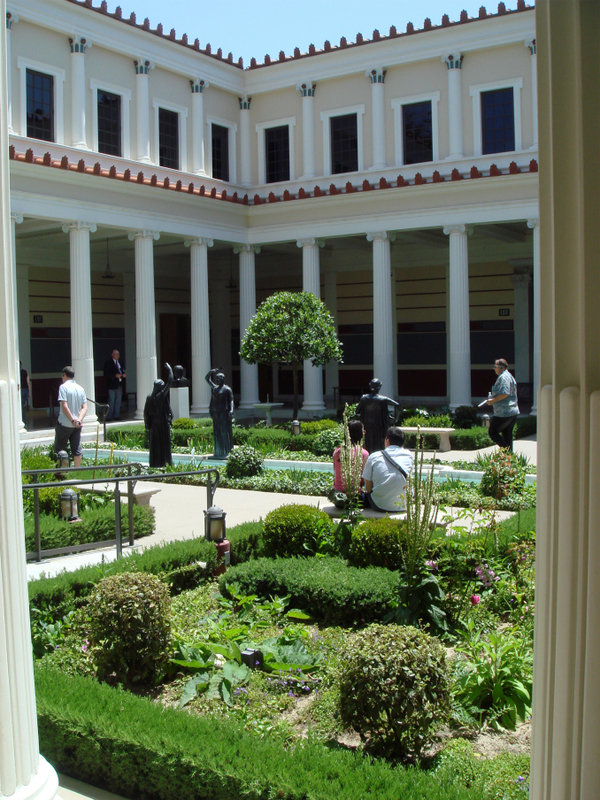 Getty’s brilliance in acquiring and displaying treasures of Greco-Roman civilization is immortalized in the Getty Villa Museum in Malibu. In order to display his huge collection of sculptures, mosaics, amphoras, jewelry, votives, mosaics and other beauties in marble and bronze, Getty came up with the idea of building a replica of a Roman villa inspired by a design of one of the most famous Roman villas called Villa dei Papiri at Herculaneum. The explosion of Vesuvius in 79 A.D. destroyed this villa together with cities of Pompeii and Herculaneum and a thick layer of volcanic ash preserved art and lifestyle of the Roman civilization intact until the first dig was conducted at the site of the villa in 1750. Getty hired an architectural consultant Norman Neuerburg to create a museum where statues, mosaics and thousands of other objects from his antiquities collection would be placed in their “natural habitat” so to speak. The Villa overlooks the sea (in this case the Pacific Ocean rather than the Tyrrhenian Sea but the water is still this bluest of the blue under an azure sky), the plants are native to the Mediterranean (olive and cypress trees, rosemary and lavender), and the air and sun feel very much like that part of Italy. This is a museum to walk around rather than just look at things. You do get to see beautiful mosaics and the Cycladic sculptures but it is the act of wandering around a reflection pool, under the stone portals, over mosaic floors and by an olive tree than brings in the reality of a Roman villa as it may have been 2000 years ago. Another “experiential” museum is not only on the other side of California in San Jose but it is also as far removed in time and subject as possible from the ancient Greco-Roman world of art. The Tech Museum of Innovation boasts of the largest IMAX dome screen in the western United States and the support of leading Silicon Valley technology companies, the Stanford University and NASA. Touted as the most modern museum on Earth, it is the space for bringing the latest and most daring technologies to the public since its opening in 1998 in the present space designed by Mexican architect Ricardo Legorreta. Four major areas are devoted to Communication, Exploration, Innovation and Life Tech. In practice, this means that there are VR demonstrations, robot building, open-to-the public building of prototypes and inventions, a roller-coaster design and 200 other high-tech activities and displays. The museum is led by Tim Ritchie, the current President and CEO, whose charismatic and passionate approach to The Tech’s educational mission is amazing. 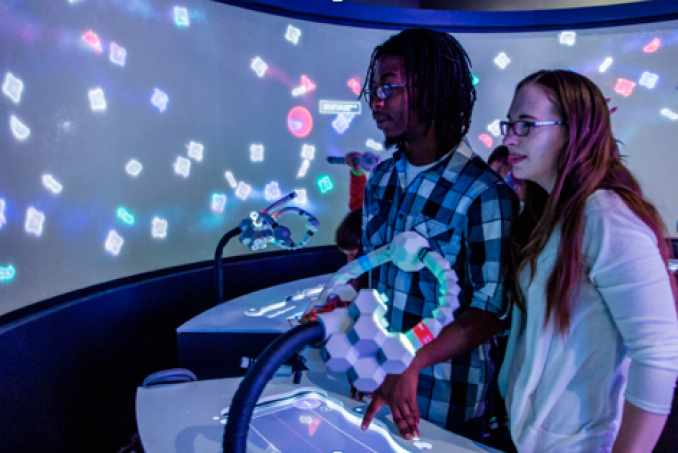 As a complete stranger, I happened to run into him on a Saturday afternoon and he enthusiastically led us through one of the most ingenious exhibits of the museum – the BioDesign Studio. Opened in 2016, this is an exhibit that allows visitors (who are mostly school age kids) to tinker with a DNA design. 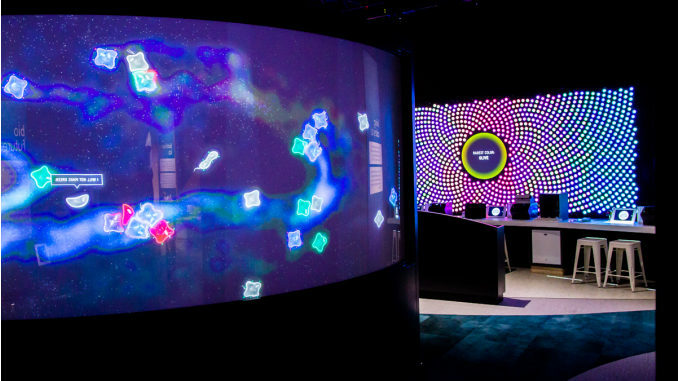 Five stations provide interactive activities such as the use of computerized blocks to build new “creatures” that will interact with those created by some other museum visitor and then be released into the digital world of growth. Other stations allow using lab equipment to create your own mix of colorful DNA pieces; and you can do experiments in a bio engineering. This is state-of-the-art genetic and bioengineering science presented and provided for hands-on play in a way that breaks down scientific processes to understandable bits of information. You do not watch a display of information about DNA – you create your own strains of DNA and create your own beings in a digital world. In a way, any 12-year-old kid can be a creator of the universe for a day. There is even a drop-in activity of transforming one substance into another by creating mushroom bricks, in which visitors use mycelium to transform wood particles that would have been sent to landfills into sustainable building materials. So… depending on where you are in California, you can have an immersive experience in Roman antiquity or the 21st century genetics.